The Public Forum last night was predictably All Downhill. Expect a downsized hospital that is not a Level 6 Tertiary Hospital. Expect more Outpatient services to be delivered (dare I say) “closer to your homes” but for which you will pay part charges (they said no, but it’s already happening as I now experience and not at part-charge rates, at full charges). They are concocting a reason to not build a Like for Like Hospital. They said they won’t do that. Nope, we have to think ‘out of the box’ as they screw with our minds – “the convenient report” arrived yesterday saying the Main Ward Block will need to be rebuilt or fully refurbished which of course they can’t afford and which ADDS MOMENTUM to the downsizing plan. But the repeated comment that the Central/Lakes district is GROWING and Dunedin is “static”, means we have to think that most of the Govt funding (see the $300m holding fund for the Southern ‘health services’ rebuild….not the ‘hospital rebuild’) will go into provision of health services in the Central/Lakes district – NOT Dunedin. God we love population based funding, don’t we. I made notes and successfully audio recorded the whole Forum fiasco. But let’s see what the ODT says. And the likes of David Clark (Labour MP for Dunedin North) who appears to have done his research. He said it again, using “a quick hospital”…. it’s still a stupid phrase in terms of the unwarranted delays. Really, he is saying NOTHING but thought that was a happy message to share (even if it’ll take 10 years). As Mr Clark effortlessly pointed out, the Australians can do a Level 6 Tertiary Hospital in 4 YEARS (from go to whoa)……. but we were TOLD we’re not going to get one of those (which we do expect as of right !!!). Blatant. They gave no site, no real figures, no scope for public consuiltation. We will get what they shovel at us – meanwhile, all their rich friends will earn fat project sums to deliver LESS HOSPITAL CARE and MORE EXPENSIVE USER PAYS (privatised health care is stepping up). The defence to make us go to sleep was the Crew saying they will deliver the same services as we get now except “differently” – given the number of Southern people on waiting lists BE WORRIED. New figures just released by Maxim Institute show a mixed forecast for Dunedin’s population growth. A report by researcher Julian Wood shows while South Island centres such as Queenstown are set to expand, other areas including Southland are facing decline. I thought Cr David Benson-Pope wrote a good OP in the ODT yesterday concerning the new hospital. He emphasised the importance of keeping the hospital centrally downtown and not in some far flung area at the edge of the city. The point about the interconnectedness of such a location, in terms of the university’s medical school and local retail and transport infrastructure to the hospital, was well put. No Sue, “patients” will always exist, whether they get effective treatment in a hospital is another thing though. Dunedin Public Hospital, located in a quiet leafy location far from city noise, would be a sorry place for anyone who needed more than basic treatment. It’s highly trained medical and surgical specialists and their invaluable nurses and all the other highly trained and experienced staff are in little shrinking flat-broke Dunedin because of the Medical School, and the Medical School is in Dunedin because of them. Nice views and silence are great but if they are the most important things to a patient he/she is lucky, when I have been in hospital it was the expertise of the staff that mattered most. It is “headline grabbing politicians” that hold the future of our hospital in their hands. I wish this were not so. I wish they took into account need, ahead of where they can have the most popular impact. It ain’t like that though. I can agree with Sue as I have just emerged from Mercy Hospital after minor surgery. The difference between private and public is sadly disconcerting and the Mercy Hospital food is second to none. Compass is a disgrace and the thought came to me why can’t patient needs be similarly addressed in the Public Sector. The rot started in the early 1990s, and Jenny Shipley has a lot to answer for. New Zealand is already feeling the effects of an oncoming wave of economic and demographic change. Over the next 30 years our main centres and areas close by will continue to grow, albeit with ageing populations. For the remainder of the country, the populations of 44 out of 67 Territorial Authorities will either stop growing or start to decline. If we do not attend to this divergence of economic and demographic outcomes, we risk opening the door to broader societal division between people and communities in growing areas and those in stagnation or decline. Eileeen Goodwin is rather quiet….. Alternative photo caption….from L to R….disinterested; disinterested; feigning interest; disinterested; experiencing pang of conscience. To me the middle one is “rabbit in headlights”. This so-called public forum follows the process created by the listening sessions where, as the sessions progressed, the speeches or presentations by the panel got longer and the opportunity to contribute got less. Words like “vague”, “drivel”, “rubbish” seem to sum up the forum. The problem has been identified in terms of the need for a rebuild, the issue is really one whereby the Government does not want to pay for a replacement on the scale that is currently in existence. They recognise that Dunedin is in population decline, they know that while the need to have good links with the University are essential, that it might be time to think about the wisdom of continuing having the Medical School in Dunedin. I wouldn’t mind betting that discussions have been held about a shift north for the school. After all, why bring hundreds and hundreds of Health Science students from the North Island when they could stay near their homes? The regions are not important to the National Party – their voting base is in Auckland and the agricultural sector. Just pause for a bit and think just why would the funders for a replacement hospital not think that it would be a good idea to shift the medical school. Such discussions would not involve the University of Otago who would fight any shift tooth and nail, but a hospital rebuild funded only to the level required by the current and projected population would be an interesting step along the way…. The University of Otago already has medical school ‘campuses’ (buildings and presence) at Auckland, Wellington and Christchurch. No skin off its nose if the Government helps part-fund their ‘centralisation’ on a population basis. As heard from the SPG’s Andrew Blair at the Forum, the new Dunedin ‘hospital’ will be completed at the earliest in 2022 and at the latest 2025. Only this week SPG chairman Andrew Blair said there was no time to consult the public about the rebuild. OPINION Dunedinites and the southern public are in something of a quandary. On the one hand, people want to have confidence in the Government appointees tasked with running our district health board in the absence of publicly elected members …. they simply want to be reassured that when they most need help for themselves or their loved ones, timely, reliable and quality healthcare will be available close at hand. On the other hand, the more such reassurances are desired, and the less forthcoming the response from authorities, the more the frustration and anxiety builds. There was public interest and expectation ahead of this week’s public meeting on the hospital rebuild …. The forum was the first time the public had been invited to hear specifically from those planning the rebuild. Attendees were seeking details about fundamental aspects of the project, which has been beset by delays. But critical aspects of the rebuild (cost, size, composition, status and location) are still unclear — or undisclosed …. Issues of transparency are at the fore …. The public does wonder what is not being disclosed, and information once routinely provided is now harder to access …. Southern Partnership Group chairman Andrew Blair has said it is too soon in the rebuild project to discuss “site-specific options”, yet only this week said there was no time to consult the public about the rebuild. said the board had consulted the public extensively and knew what it wanted. Politicians of all stripes agree that a Dunedin Hospital rebuild needs to happen, but unfortunately the current Government has been dragging its feet on committing to timeframes and capital. Their representatives have argued that careful planning, to future-proof the hospital, has caused delay. This is rot. 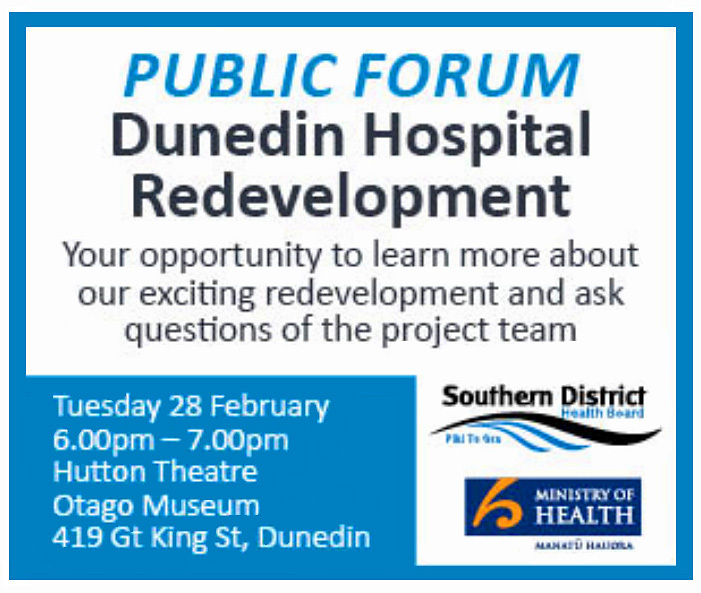 OPINION Frustration was evident at last Tuesday’s public meeting held to discuss delays on the Dunedin Hospital rebuild project. Fair enough — I was frustrated too. The meeting had an inauspicious start. Chairman of the rebuild group Andrew Blair began the meeting by demonstrating that he wasn’t familiar with the names of two of his group’s five members. The group was established in 2015. This very public gaffe gave credence to the prevailing view that the partnership group doesn’t meet often enough, and thus lacks the urgency required. At the public meeting, we were told that the partnership group is one and a-half years into a process that could take 10 years. Change is on the cards for the way health boards pay for new hospitals, which may have big implications for the cash-strapped Southern District Health Board. A high-level review is under way of capital charges, which are interest payments on the Crown finance provided for hospital builds. The annual payments can hamstring DHBs financially. In a paper released under the Official Information Act, officials blame the long delay in rebuilding Dunedin Hospital on the capital charge regime. Designed to impose financial discipline, they made boards wary of building new hospitals because of cost. Oh terrific, a review. Another delay. How much longer can they dither? The bull**** about the Ward Block stated by Andrew Blair (chairman, Southern Partnership Group) at the Dunedin Hospital Redevelopment public forum on 28 February is now repeated in the ODT. A recent structural assessment of the ward block is understood to have indicated that refurbishing it is not economically viable. 1) A bigger & better hospital for the (presumably fixed) budget due to extra space and reduced cost of rebuilding on the present site which has not a sweety paper’s worth of room to spare. 2) Reduced disruption while building. 3) Better vehicle/ambulance access from pretty much all directions. The one-way jams up solid in the rush hour now. Vehicles standing on these roads at present can wriggle aside for ambulances to get though – but after the cycleways go in? 4) Better parking for patients and visitors. 5) A ground level helicopter pad – every time a chopper comes in at the present rooftop one in the dark/in a high wind or both – we roll the dice that may lead to flaming wreckage being strewn around the City Centre. 6) Opportunity for further expansion/ancillary buildings. These all add up to a compelling medical based case for moving it. I am wondering whether we are dealing with other non-medical agendas here. I wonder if investments have been made in land etc by various parties, around the hospital – particularly in the North Westerly direction, and that the profitability of these investments/plans may be disadvantaged by any such move. I suppose one has to ask is: is the site selection priority to cure people who visit the hospital or to reward speculation and/or to sell them sandwiches? When I lived in Oxford, the Radcliffe Hospital was moved from its central site just to the North of the University area to a new John Radcliffe location on the outskirts of town, relatively further out than Wakari – I observed no collapse of either local medical services or the University’s medical school that could be associated with this move. Sound opinion piece from Sir David Skegg. “Tracey Mains We had no power in Fairfield on Monday , when I rung them up they said it was a planned power cut and I should of got a letter. Nope- no letter. And why do it on a public holiday. Had I got the letter i would of planned better. I was totally peed off. Dunedin Hospital’s radiology department would have had to shift to a temporary location for several years if a work-around had not been found, information released under the Official Information Act shows. Southern District Health Board chief executive Chris Fleming told the Otago Daily Times the department was able to stay. “Our building and property team has found an effective solution and radiology services does not have to relocate,” he said. If it had had to shift, it would have been to a temporary location until a new hospital was completed some time from 2022 to 2025.